Katie Price’s PR firm, Orange Bandwagon, has announced that the glamour model, known as Jordan, has “so totally, absolutely got that Swine Flu that’s in the papers”. 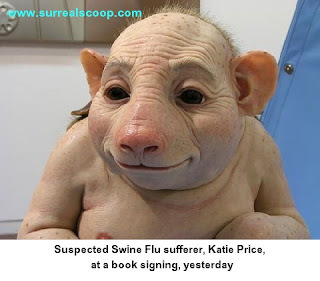 Medical experts are said to be deeply concerned now that the previously harmless Swine Flu virus, having now contracted Katie Price, could mutate into a much more deadly sickness that could sweep through the nation. “Our first analysis would be that symptoms would include the development of huge, unsightly swellings on the chest and the ability to project caustic venom like something out of the film Alien,” said Professor J. Scott Billingsworth. The government said that there was genuine reason to be alarmed as, whilst unlikely to be fatal, the virus could cause people to completely lose all sense of shame. Due to increases in bodily temperature sufferers will also be unable to keep their faces out of a trough of Champagne. Or their vaginas away from fans. Not everyone is fearing the spread of this toxic, vomit-inducing malady that seems to be increasingly infecting the country. Disc Jockeys facing the end of both their youth and their residency in small clubs in the Balearic Islands were said to be looking forward to “catching a dose”. Balding DJs aside, medical experts were adamant that a Jordan-Swine Flu hybrid would cause widespread sickness on a scale not seen since the outbreak of last year’s Mills-McCartney misery. The news of Katie Price’s illness was broken in a press release by Orange Bandwagon announcing the glamour model’s new range of Tamiflu based remedies. The new range is said to have no more ability than common Tamiflu but comes in a range of tasteless packages. Record success for "tying a child to something"